To mark International Plumbing Day on Saturday, The Signal asked a few plumbers about some of the unexpected things they find in toilets. Halifax plumber Adam Simpson says that “people usually use the toilet for one reason,” yet he’s seen many things that aren’t meant to go down in the loo. “I’ve never seen anything cool like an alligator,” he says, but he’s seen a couple of cell phones, toothbrushes, a golf ball and even a beer bottle at a frat house. The most common items he usually finds on a job are kids toys. Plumber Richard Samwayms agrees. He’s seen kids toys in toilets so often that he doesn’t even think of it as odd anymore. The strangest thing Samwayms has found were fake teeth in a motel toilet. To this day he wonders if those dentures were ever worn again. Evans Plumbing receptionist Alicia Maxwell reads the write-ups plumbers have to provide after they finish a job. 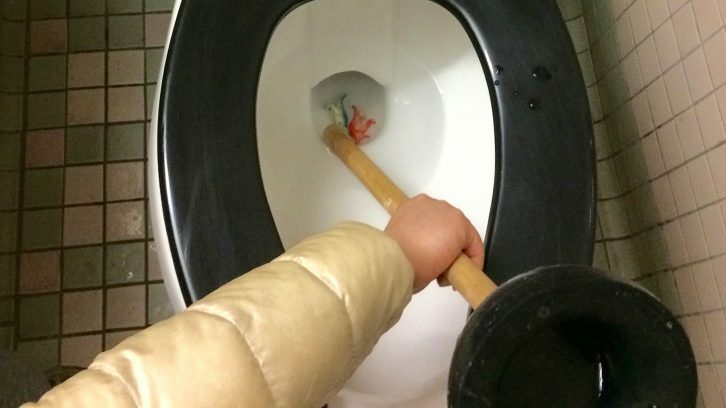 “Basically anything that can be found in a house can also be found down the toilet,” she says. Simpson and Samwayms both say they never try to make the client feel embarrassed for what they find in their toilet. “Nine times of 10 you don’t have to tell them that stuff doesn’t go into the toilet, they know,” says Samwayms. International Plumbing Day is March 11. It was initiated by the World Plumbing Council, a non-governmental organization, recognized by the World Health Organization. This may seem like an odd celebration, but Halifax Mayor Mike Savage is supportive of the day. He said in a declaration that Halifax recognizes the day for environmental and health safety reasons. Plumbing infrastructures are shown to conserve water, which helps reduce global climate change, while water sanitation helps prevent illness. According to the World Health Organization over half a million people don’t have access to clean water. Over two billion people don’t have access to a clean and functioning toilet and more than 300,000 children die a year from illnesses caused by dirty water.